In my professional life, I belong to a smart group too. Smart woman Linda Lee and I, Writing-Career Coach Teresa LeYung Ryan, invited 5 colleagues and formed a master-mind group. 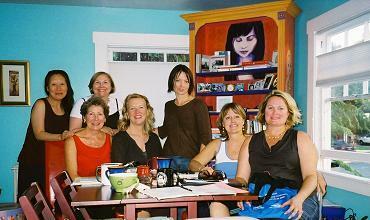 Each woman had specific goals, different interests, but we had one thing in common–we were all writers. At our first meeting on March 29, 2008, we set up rules, goals and commitments, and pledged to support each member of the group as well as the group as a whole. 7 women. 7 colleagues. We called ourselves the Savvy Seven and met once a month. Lori Noack, founder of Lori Noack Arts Management. She’d be a super executive director for any organization. Each member of Savvy Seven has accomplished her goals & commitments; each one is pursuing new dreams. March 2010 will be our second anniversary.